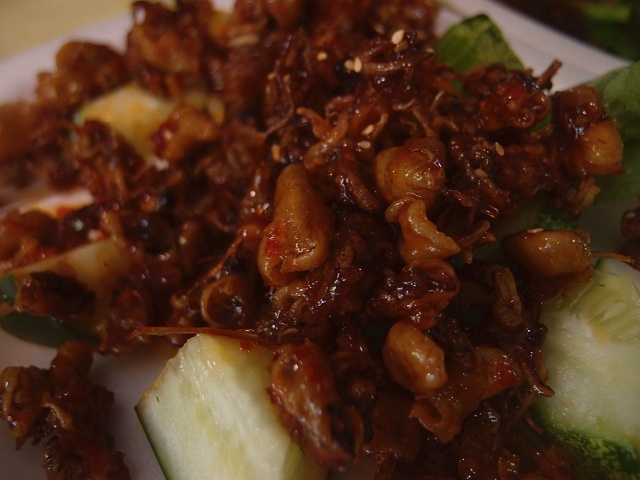 Ideal for snacks or a stater, this crispy squid can be served on its own. It is fast and easy to cook – an instant favourite at hawker stalls and seafood restaurants in Singapore. Wash and dry the squid thoroughly, leaving the tentacles and skins remained intact. Dry squid with paper towels. Deep-fry the baby squid until golden brown, and drain on paper towels. (Optional) Over high heat, quickly deep-fry the onion and pineapple chunks for few seconds and drain the oil. Set aside. Return 2 tablespoons of oil in the wok. Heat up the oil again. Add the Thai sweet chilli sauce, dark soya sauce, sugar and salt. Stir mixture well. Taste. Throw in the crispy fried squid to the wok and stir fry until they caramelise and become crispy. Add in the onion and pineapple. Mix well and turn off the heat. On a serving plate, lay some salad and cucumbers. Fill the plate with the Crispy Baby Squid. Sprinkle some sesame seed over the squid. Serve as a starter, snack or with other dishes. We had exactly this recipe at a restaurant in Singapore, but they burnt it! I’m so glad I can make thirds now at home, without burning it up! We tried this yummilicous crispy baby squid at one of the restaurant in Eastcoast. I will definitely try this recipe. Thanks for sharing this!